Heavy rain overnight, finally clearing about 1:00. After a light lunch we walked the trail that took us through the other camping loops, ending at the second beach and fishing pier. 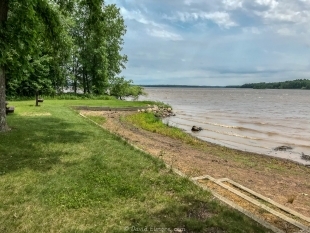 The camp sites along the Lake edge have walkways to the lake and places where boats can be pulled up. Nice for fishermen who wish to get up and go out early. I have found a new app for my phone that works pretty well: Seek. In the app you take a picture of a flower or a leaf and it identifies it. It did well on all items photographed except for a wild geranium that it thought was an anemone — easy error if my picture wasn’t too clear. It also did a good job of identifying bass and sugar maple trees and chicken-of-the-woods. Give the app a try, it’s free from iNaturalist in the App Store. More rain and thunder in the afternoon.